2018: The year AI and IoT converged - IoT predictions 2018: What will the next year of connectedness bring? AI and IoT are two of the biggest buzzwords in the industry, separately garnering headlines and stealing the spotlight. But what happens when the two come together? 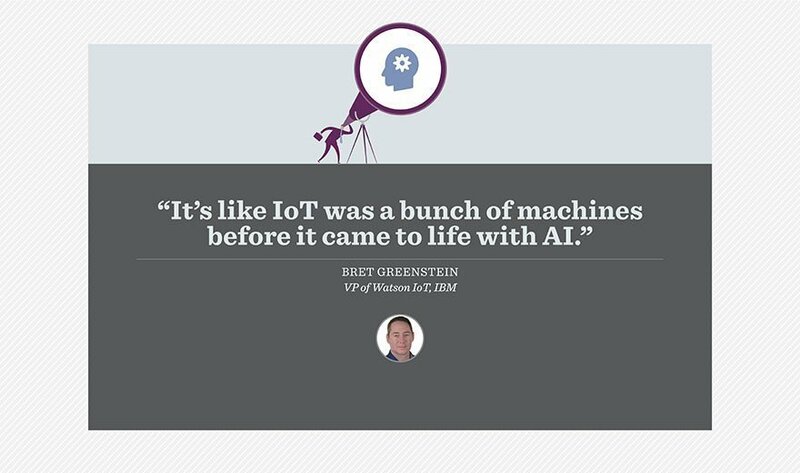 Bret Greenstein, vice president of Watson IoT at IBM, explains why the marriage of the virtual (AI) and the physical (IoT) in 2018 may be one of the biggest transformations we have seen to date. "There's a pivot that has happened as IoT has moved from platforms and APIs and developers -- all of which are still very important -- to getting more value out of IoT. It's happening in part because of the convergence of AI and IoT. AI has helped in the case of IoT by offering a better way of understanding the patterns in data, creating learning models and learning systems and being able to use intelligent devices for image recognition and acoustic and sound recognition. In a way, it's like IoT was a bunch of machines before it came to life with AI. "AI is an interesting technology on its own, then when you combine it with IoT, you're effectively giving it eyes and ears; you're putting a body in interaction with the physical world. AI on its own is disembodied. And IoT devices are somewhat mindless. Bringing these two together is creating use cases that are very powerful; it's breaking down the barrier between people and machines. "When you bring together the internet of things and the internet of people and use AI as an interface that understands what is sees, understands what is hears and understands our meaning and intent, you can then use IoT to make it take action." Do you think AI and IoT is a force to be reckoned with?